Another strange device was the “Butterfly Bomb” which first made its appearance in 1942. It was so named because as it fell an outer shell hinged open to form “wings”. The tiny 2kg bombs were packed into containers holding up to 100 each. The container opened as it left the aircraft, releasing the winged bombs to float down like sycamore seeds. The rotational action of the wings armed the fuze as it descended. After it landed, the slightest disturbance would set the bomb off. On Thursday, 12 February 1942, Carroll was called again to the city’s Royal Opera House. To the right of the Opera House was a building that ran across the present square with a balustrade on top from which a bomb was hanging suspended over the street. When Carroll reached the square he saw that the balustrade had a tiny ledge jutting out towards the street. The only way that Carroll could get to the bomb was to crawl along this ledge. He went up to the top of the building and inched along the ledge on his knees. When he finally reached the bomb, he found that it was another type that he had never seen before. It was small, made of metal and it was attached to a wire. Carroll could not attempt to defuze an unfamiliar bomb on a narrow ledge overlooking the street. So he cut the wire and carried the bomb in his hands back down to the street. Malta’s 2,000th raid occurred on Tuesday, 7 April 1942. The centre of Valletta took a terrible pounding, suffering the impact of 280 tons of bombs. In that spring month the enemy mounted 9,600 sorties, day and night, having flown 4,900 sorties in March. By 20 April, 333 people had been killed. 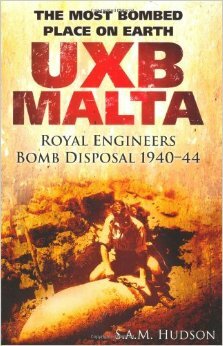 Malta’s RE Bomb Disposal dealt with more than 267 HE bombs of 50kg or over. For the attacks against Malta the Luftwaffe could count on 520 aircraft and the Regia Aeronautica had some 300 at its disposal. Odd though it may seem, it was an unexploded bomb that came to symbolise Malta’s stubborn resistance. At around 16.30 hours on 9 April 1942, the Luftwaffe undertook its second raid of the day. The parishioners of Mosta, a town to the northwest of Valletta, were attending mass in the Catholic Church. This beautiful building is famous for its dome, which is the third largest unsupported dome in the world. The priest taking the mass took command of the situation and ushered his congregation out into the street. As usual, Carroll was called. It turned out to be a German SC500 (the SC standing for Spreng Cylindrisch). This high-explosive generalpurpose bomb had penetrated the dome nose-first making an almost perfectly round hole in the famous roof. The bulletin ended with these words: “In civil life, anxiety neurosis will put you ‘in the club’. In battle it brings you a bayonet in the bottom.” The population and the fighting people of Malta proved tough enough and, as it is well known, the island was awarded the George Cross. This was granted by King George on 15 April 1942, with the words “to honour her brave people, I award the George Cross to the Island Fortress of Malta to bear witness to a heroism and devotion that will long be famous in history”. The last raid on Malta occurred on 20 July 1943. It was the 3,340th alert since 11 June 1940. In total tens of thousands of bombs, amounting to 17,000 tons, were dropped on Malta, destroying some 30,000 to 35,000 buildings (11,000 in April 1942 alone). Some 1,493 civilians were killed and 3,674 wounded out of a population of just 270,000. As for George Carroll, he left Malta in June 1942 and survived the war. He had served continuously through some of the toughest months of the bombing, working through over 2,000 alerts.